Featuring Meghan Allison from Innovative Sugarworks, Sue Balfour from Katy Sue Designs, Chef Nicholas Lodge, Stephen Benison, Colette Peters, and Rob Baker-Gall of Mister Baker’s Blog. 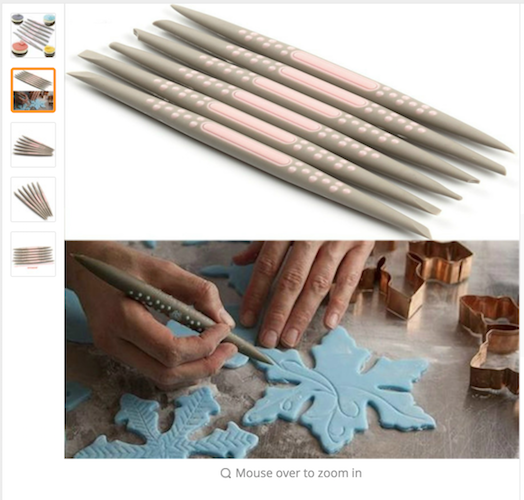 If you shop at a reputable store for this Silikomart set, it will show you that you are getting all of the pieces necessary to create the pictured desserts. Here is a screen cap from a knockoff shop. They are still showing you the original end result for which you need those other bits of the kit (or would need to hand-cut the internal sponge and make a separate glazing mask), but they aren’t even showing you the bits they’re leaving out. 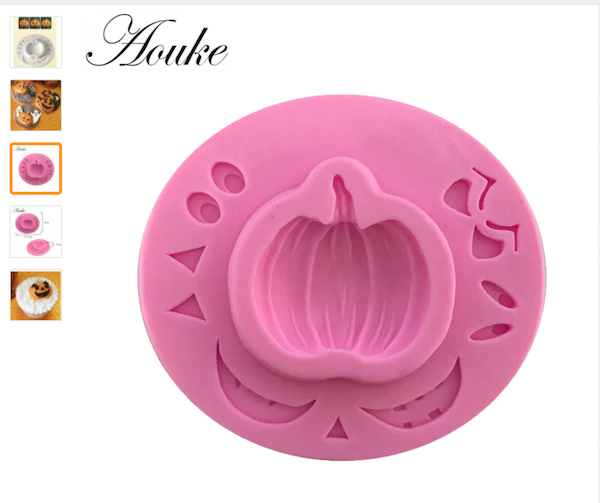 In the product description for this sale page, it’s obvious by the size given and materials listed that you’re only going to get the silicone piece, and “in any colour” which likely means you’ll be getting a poor grade of silicone that may not even be food safe. 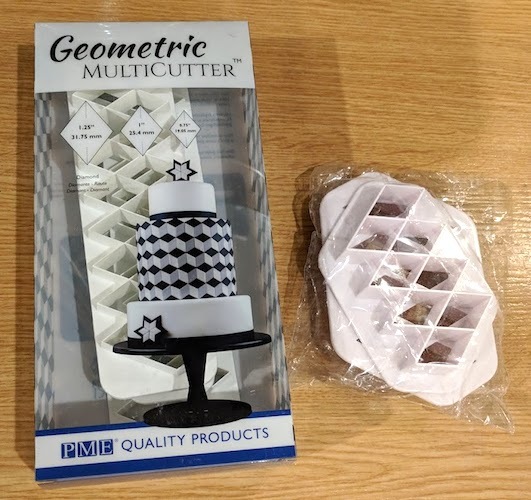 Here’s my comparison of a genuine PME Geometric Multicutter versus a cheap similar product. This one isn’t a direct copy, but I want to show you how you really do get what you pay for in terms of quality when you buy from a recognized manufacturer versus a discount import site. 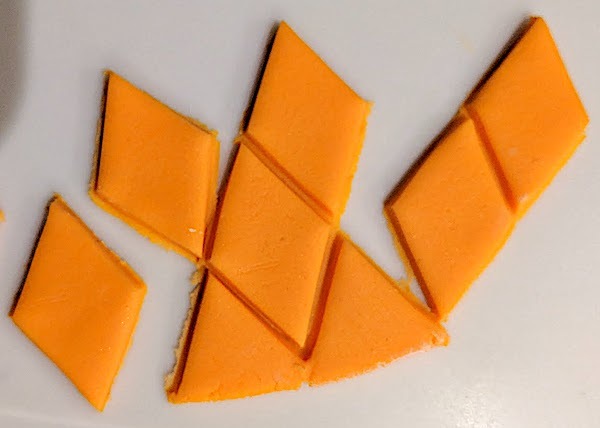 I bought this set ages ago with the intention of doing a blog post about how bad cheap cutters can be, but instead ended up doing this podcast episode. 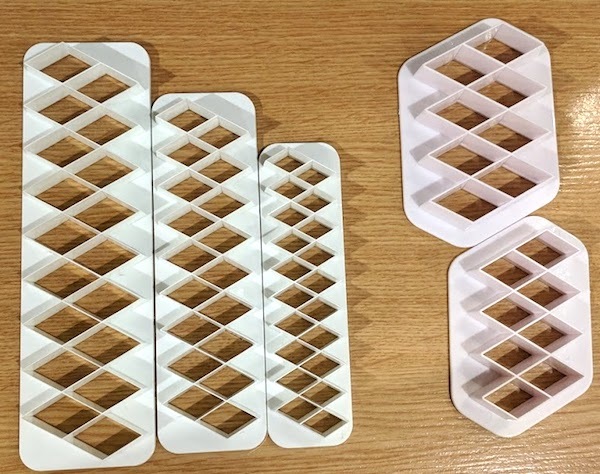 The PME tool set in the package versus the cheap version. You get three obviously varying sizes in the PME set, and two sizes with less difference between them in the cheap set. The difference in sharpness is very clear to see. 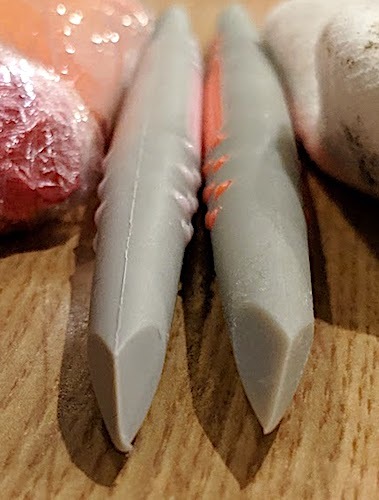 I rolled out a single piece of sugarpaste and then used the PME cutter on the top half and the cheap cutter on the bottom. Closeup of the PME cuts, which were quick, easy, and clean. Closeup of the cheap cuts, some of which were still stuck together despite pushing and rubbing it around the board, because the cutter doesn’t even sit flush against the board. Even the ones that are cut have a ragged edge. 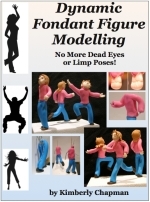 The PME set goes for £5-£6.95 on various sites, and the other set can be found for about £1.25 to £2. 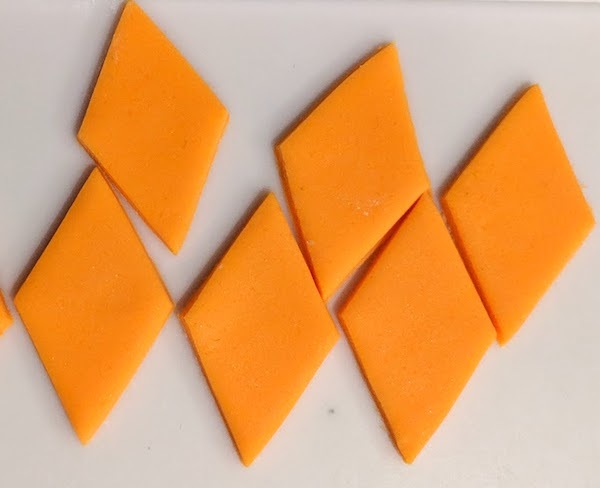 So you’ll save about three to five pounds but look at what a difference in quality you’ll get and then ask yourself when you’re re-cutting all of the poorly cut pieces or trimming the uneven ends if you wouldn’t pay four pounds in that moment to not have to do that. Again, this is not a direct knockoff product, although many of the sales pages for this cheap set use PME sample cakes in their advertising, and there are many direct knockoff copies available as well. And as mentioned by myself and several people in the episode, it’s one thing if someone sees a multi-hole cutter and decides to make their own version that’s better or satisfies a different need by the end user. 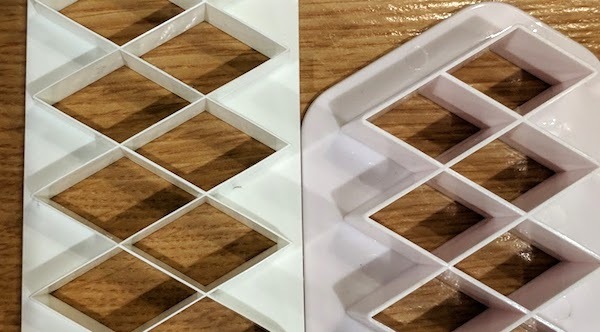 But in this case, the cheap cutter – while not a moulded copy – really is a poor quality substitute and you will not get your money’s worth out of it. Sometimes you can go cheap. 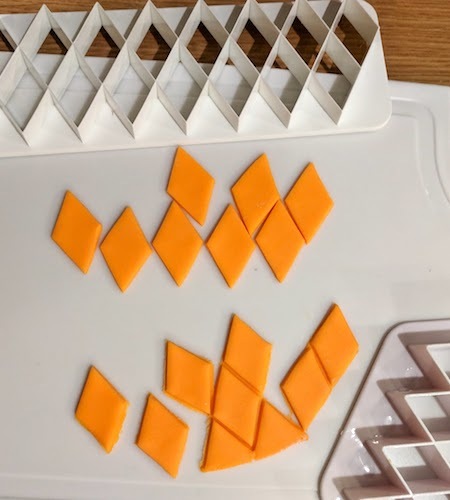 I’ve purchased cheap plastic circle and square cutters for when I teach kid classes and they’re fine. But when I’m doing my own precision work, I always turn to my genuine Ateco metal graduated sets. You have to consider what you’re going to use the product for and whether or not going cheap is really saving you anything in the long run. 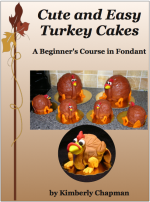 Sidney Galpern wasn’t available to make it onto the podcast but you can see her Facebook post about her isomalt mats being reproduced here. Listen to the knockoff Sugar Shapers arrive at Meghan’s house when I interviewed her and Kaysie Lackey back in episode 11. 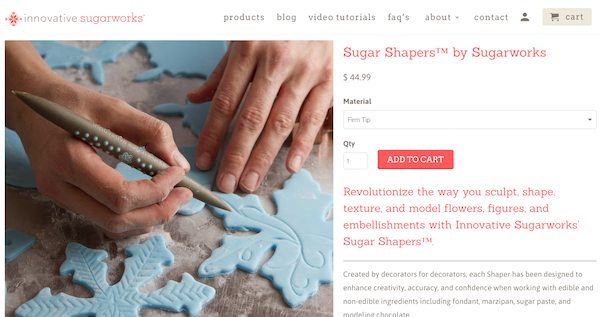 Here are Meghan’s own hands on her own website demonstrating use of the Sugar Shapers. Click here to go to this actual page. Here’s a screencap from a knockoff seller showing their pink copies of Sugar Shapers above, and totally stealing Innovative Sugarworks’ photos below. Meghan’s own hands have been used in someone’s knockoff advertising. I was given a set of the knockoffs to compare to my Innovative Sugarworks Sugar Shapers, so here are some photos showing the difference in quality. First of all, this is how the knockoffs arrived. They’re clearly not branded in any way. 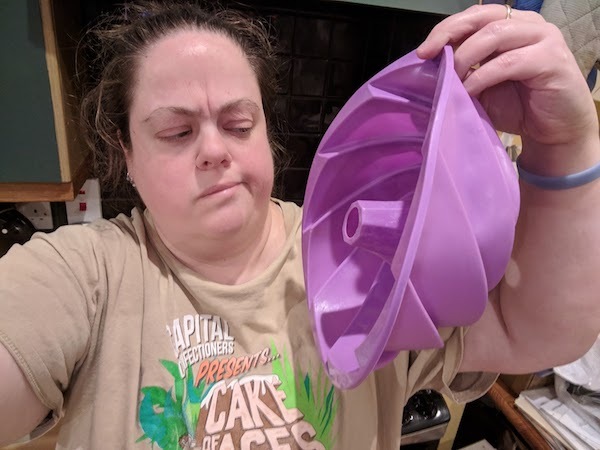 If you think you’ve ordered genuine Innovative Sugarworks Sugar Shapers and what you get comes like this, you’ve been ripped off. This is what genuine Innovative Sugarworks packaging looks like. 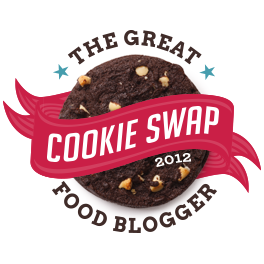 Click here to go to the Innovative Sugarworks product page where you can learn how to buy the real thing. 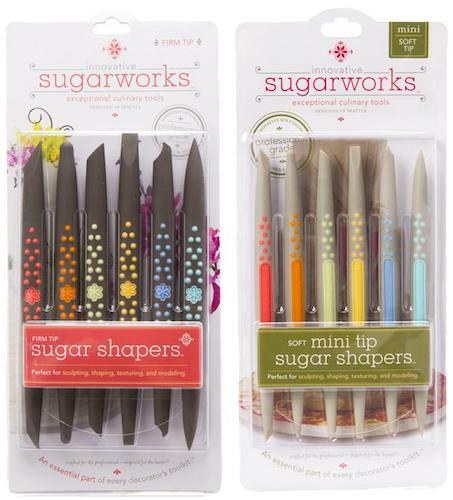 Genuine Sugar Shapers have Innovative Sugarworks branding stamped right on them. Knockoffs don’t. Again, there are legitimate competitor products out there that will have their own branding, but this is clearly a direct copy with the name Innovative Sugarworks taken off. Now look at the actual tips for comparison. The knockoff has a visible seam that’s going to interfere with your work. The genuine product does not. 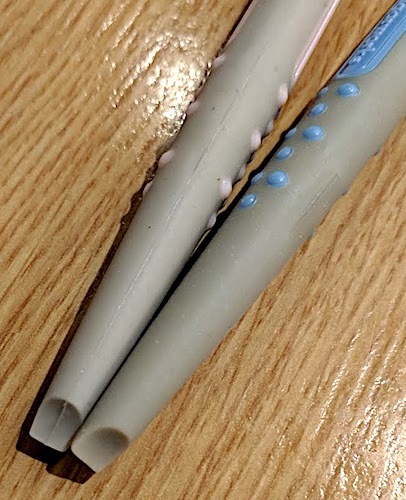 Here’s another style of tip, with the knockoff on the left and the real Sugar Shaper on the right. The real one has a straight, neat, thin edge. The knockoff is none of those things. A thing I can’t really show you is how different the feel is between the original and the knockoff. The original soft tips bend in a consistent, even, smooth way. The knockoffs are very squishy at the tip and then get rigid quickly, but not in the even, firm way that the original firm tips are. You can feel the original Sugar Shapers curving along as you work, but the knockoffs feel like a stick of cheap rubber that might break at any moment. They’re not going to flow with your work. From left to right: a knockoff, a Sugar Shaper Soft Mini Tip, and a Sugar Shaper Firm Mini Tip. You can see the seam on the knockoff, but I assure you the two legitimate tools give a solid, even sculptural result as you work, while I have zero desire to even try the uneven-bending knockoff. Here’s the new “That Takes the Cake!” Code of Conduct. 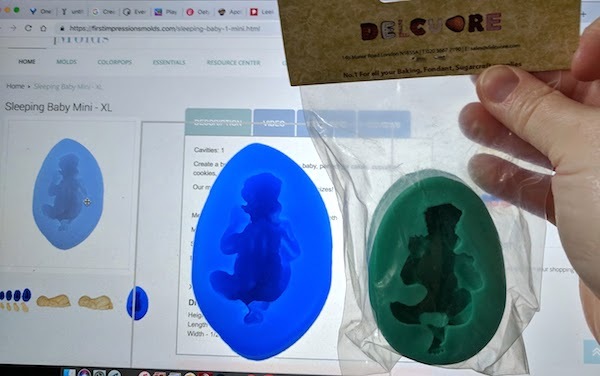 Here’s the suspected knockoff I was sent from a British store asking me to review their supposedly original products, held up to my laptop screen showing First Impressions’ baby mould (click here to go to the First Impressions page to order their original product). I’ve since had other retailers carrying the brand shown on the package tell me it’s a legitimate brand, but I remain skeptical and will personally avoid buying it. 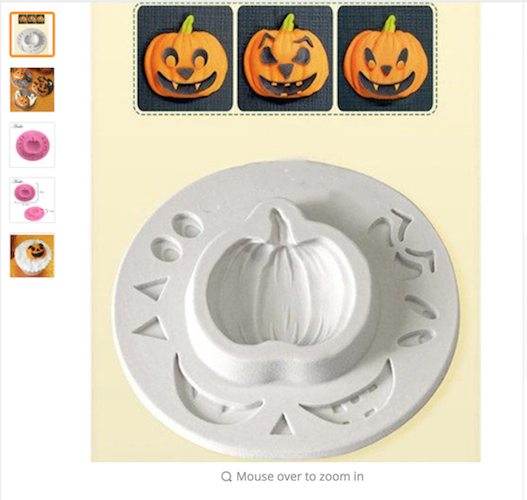 I couldn’t find the knockoff pumpkin face mould I mentioned to Sue when I spoke with her, because as I said I’ve never used it, having not expected to get it in the first place and feeling guilty about even owning it. I thought I knew which drawer it was in but it’s not there so I’ve probably hidden it on myself somewhere in this kitchen. So instead for comparison I found a knockoff site’s sale of the same product to show you how they’ve just smoothed away Katy Sue’s branding. 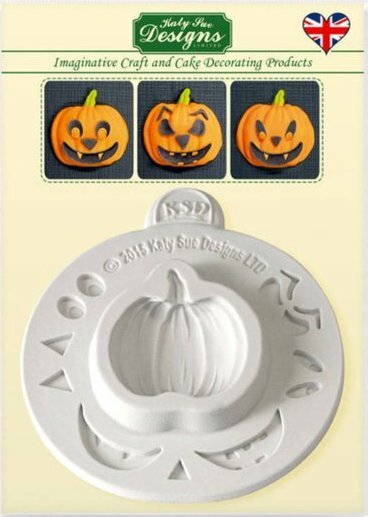 Here’s Katy Sue Design’s actual Pumpkin Face Mould packaging. 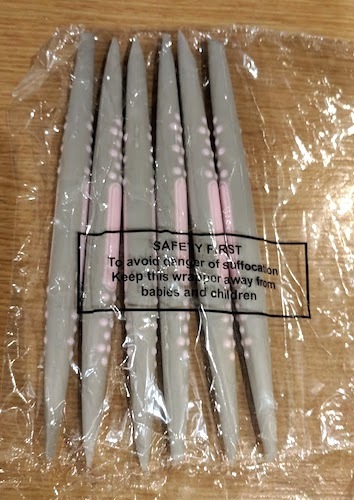 You can see their name right on the mould itself. Click here to go to their store to buy it. Here’s a knockoff shop’s sale page. The Katy Sue Designs logo on the mould has been edited out, but they’re otherwise completely stealing the graphic and putting it on their own sale page. 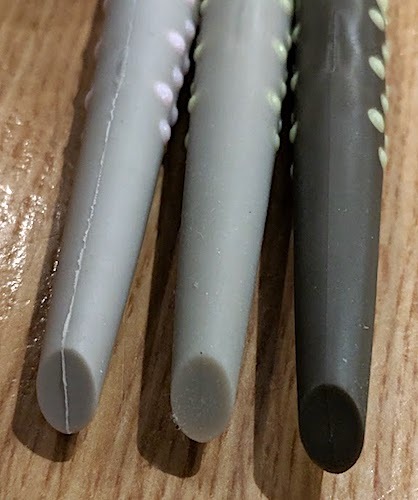 Here’s what the knockoff shop will actually send you: an inferior-quality silicone that may not be food safe, with the Katy Sue Designs logo scraped off. Here’s a genuine Katy Sue mould I got from Cake Bag held up against my laptop screen showing a knockoff shop’s page for an obvious copy of this mould. Once again, you can see they’ve trimed the side to cut off the Katy Sue Designs labeling, but still gone ahead and taken Katy Sue’s original photograph. I’ve blocked out the name of the knockoff shop because I don’t want to give them any advertising. 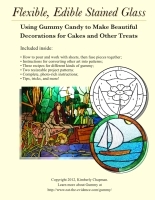 Click here to purchase this mould directly from Katy Sue Designs. Click here to sign up for Cake Bag. And here’s the awful bundt pan I ended up with when I thought I was getting a bargain. I looked it up: I paid £4.68 for this garbage. It’s so flimsy it barely held the batter I put into it, and it didn’t bake properly. 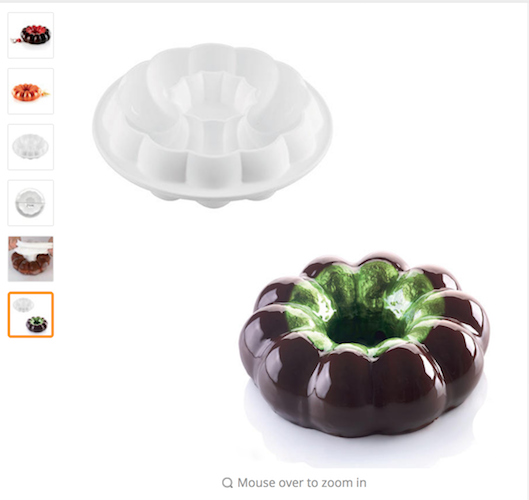 I’m pretty sure even if I tried to use it for a jelly mould that the weight of the gelatin/water would make it fall over. It’s trash. Utter rubbish. 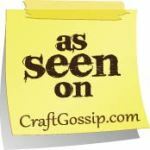 So if you have a fun, wacky, or even a serious idea of what I could use it for – anything goes! – leave me a voicemail message on Facebook and I’ll put suggestions on the show in a future episode. If I get enough good ones I might even turn it into a contest for something that isn’t trash.